Wednesday morning, Electronic Arts’ Real Racing 3 for the iPhone and iPad has received another Lamborghini-themed update bringing out several new features, cars, tracks and other content, including classic Lamborghinis such as the limited-edition Miura and the legendary Countach. Fans of multiplayer gaming should appreciate that the free-to-play game has introduced a new eight-player, cross-platform multiplayer mode with real-time racing and drafting. Jump past the fold to learn about other enhancements in this update. I’m loving replays with TV-style aerial and wheel cameras, as well as a revamped and decluttered main menu with way better navigation. The racing school is nice, too, allowing you to practice drifts, improve driving skills and even win a free BMW Z4 sDrive351s. Clash of the Classics: This new Series sees three iconic manufacturers battle to claim their place in supercar history. The previous update has enabled a Speedrush TV mode tasking you with landing a job driving dangerously for a TV commercial. Some North American and Japanese players have been able to play the latest update early, which may cause problems for folks who are currently competing in the Speedrush TV challenge. Developer Firemonkey advises against updating until they’ve sorted out the issue. 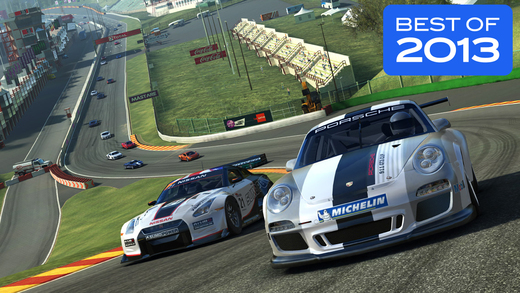 Real Racing 3 is available free of charge and includes In-App Purchases. The 1.29-gigabyte download requires an iPhone, iPod touch or iPad running iOS 5.1.1 or later, including all iPhones from the iPhone 4 onward.